Four new Avvento candlesticks in lovely nordic grey scales has joined this collection. The four stylised fir trees have a strong expression and may be placed separately or arranged in groups. They form a radiant forest and will make a fine advent wreath. 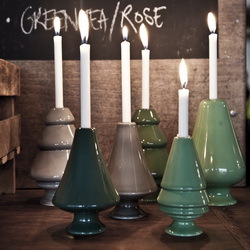 The candlesticks are glazed in unique green colours. They are perfect for Christmas tree candles, and the slim candles go well with the candlesticks; the reflection in the shiny glaze looks amazing. Avvento was designed by Marianne Nielsen, who is also the designer of the Primavera series – consisting of leaf-bearing trees that may be used as vases – and the trees match in size. Thus, you may expand and vary your forest to make it match the interior design of your home. The beautiful Avvento trees are not just for Christmas. They may be used in many different contexts according to taste and the time of the year.